In the spirit of if-life-gives-you-lemons, make-lemonade, TPP decided to do a weed of the week, although this feature will probably be a bit more irregular. Partly this is because, like other plants, weeds are different in different parts of the world, and TPP forgot that everyone might not know what crabgrass is until after being reminded of this by a reader. 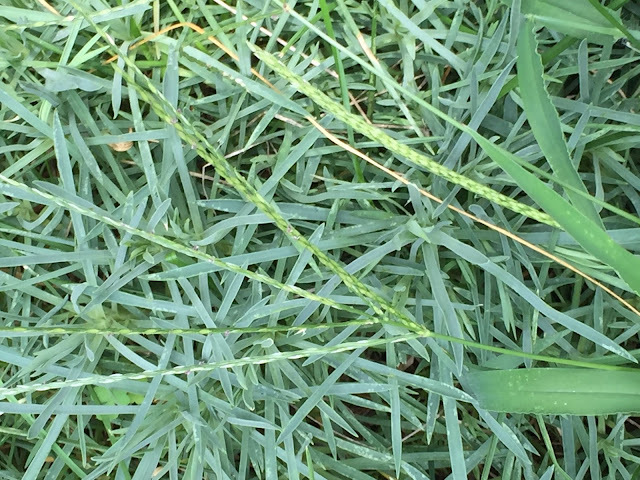 Crabgrass is one of several species of Digitaria (not Digitalis, foxglove), our predominant species is D. sanguinalis, hairy crabgrass, is a C4 annual, which explains why it grows so well in our dry, hot summer season. You may have to look up C4 photosynthesis if you don’t know what this means. The details are not important, but it means C4 plants are more efficient, or less wasteful, at higher temperatures or under drought conditions. Crabgrass can easily overgrow other plants and because it roots down along the way it can be tough to pull, and even leave a blank space if pulled and opening other weeds can exploit. This is a tough weed to control and the bane of lawn purists. In the late spring people can treat their lawns with a pre-emergent herbicide and prevents the crabgrass from germinating. In isolated patches and small areas the seedlings, easily identified by their broader and more upright blades, can be plucked from you lawn or hoed out of a garden bed. At a more mature stage pulling or hoeing is not practical. If it takes over more than 60% of your lawn, most experts recommend nuking the area and starting over. Really dense turf grass can resist crabgrass, but that takes watering and fertilization. And TPP didn’t want turf grass in the first place, so that’s rather counterproductive unless you are a lawn purist. In TPP's grassless-shady-lawn world where it's one weed vs. another, blue violet and creeping Charlie, Glechoma hederacea, both do better than crab grass, so the better weed wins, so to speak. Still TPP had no trouble finding some to photograph in a sunnier garden bed. The Digitaria (fingers) part refers to the long narrow inflorescence of tiny “seeds”, in parts of Africa a species is grown for its cereal grains called fonio. Here overgrowing a pink's foliage.